Validation of the CMEMS Arctic MFC results for sea level anomaly and geostrophic velocity is performed using altimeter data from the the Jason-2 satellite and (from 2016-09-08) the Jason-3 satellite. These data have been corrected for a number of processes, including removal of the tidal signal and correction for the inverse barometer effect. See this document for an explanation of the various corrections that are applied. Note that altimeter data from Jason-2/-3 are assimilated in the EnKF used in the TOPAZ model. However, we use an updated product for this validation, which may have improvements due to an updated computation of the inverse barometer, and more precise knowledge of the satellite orbit. Each Jason cycle is diveded into 254 tracks, half of which are ascending and half are descending (more below). The instrument's sampling frequency is approximately 0.927 Hz, corresponding to a horizontal separation of about 18.5 km along the track. Jason-2/-3 data are available from the CMEMS product SEALEVEL_GLO_PHY_L3_NRT_OBSERVATIONS_008_044. Validation of the CMEMS Arctic MFC results for sea level anomaly and geostrophic velocity is also performed using altimeter data from the the CryoSat-2 satellite. These data have been corrected similarly to those from the Jason missions (see details above). The CryoSat repeat cycle is diveded into 5344 tracks, covered during 369 days of operations. This repeat cycle is made up of sub-cycles from approximately 30 days. The orbit period is 99.16 minutes. More information about the CryoSat mission is available from ESA. 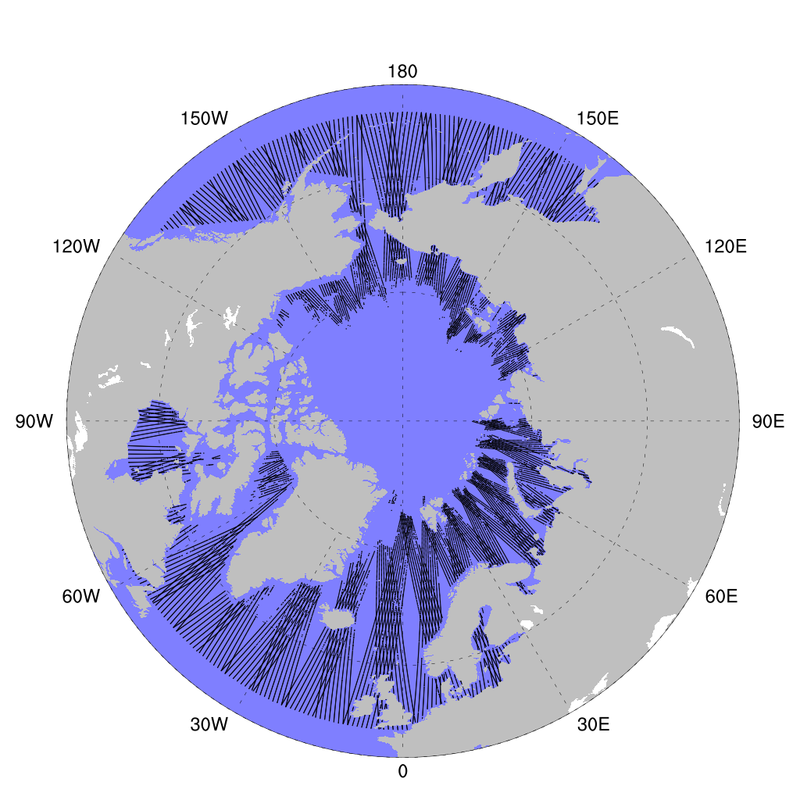 CryoSat-2 data are available from the CMEMS product SEALEVEL_GLO_PHY_L3_NRT_OBSERVATIONS_008_044. The validation is performed using processed data from the altimeter onboard the Jason-2 and Jason-3 satellites. The region covered by the satellite is limited by the 66° 8' parallell, as indicated in the figure below. This limit in the poleward extent of data significantly reduces the extent of the key domain for CMEMS's Arctic Monitoring and Forecasting Centre. However, using Jason-2 data almost eliminates possible problems due to the presence of sea ice at higher latitudes. Like its predecessors TOPEX/Poseidon and Jason-1, Jason-2 and Jason-3 have an orbital period of 6754 s (1:52:34). The full surface trace is constituted by 254 tracks, with one ascending track and one descending track in each orbit. Tracks in the region relevant for the Arctic Monitoring and Forecasting Centre are shown by the black curves below. The repeat period then becomes approximately 10 days. Using tide gauge data from around the world as reference, validation of Jason-2 altimetry data has revealed a standard deviation of the sea level anomaly of approxiately 4 cm, see this report for details. Note that the CryoSat mission extends much further north than the extent of the Jason missions. Data from CryoSat are available as far north as approximately 82°N. The full set of Jason ground tracks north of 50°N. Jason-2 suffered from an onboard memory error which was detected on 2013-03-25. As a consequence, there were periods with data outages in late March and early April in 2013. CryoSat ground tracks north of 50°N. The figure shows an example of the coverage during the time period covered during one of the weekly validation bulletins (17 days). Here, we take advantage of the relationship between the sea surface slope and geostrophic velocity. Since sea level data are only available along the satellites' ground tracks, we are restricted to assessing the component of velocity normal to these tracks. where g is the gravitational acceleration and f is the local Coriolis parameter. In order to compare the geostrophic velocity component derived from observations, we adopt the same approach for the model results (and not model velocity), i.e., we compute this quantity based on model results for sea level. Note that to comply with the algorithm for computation of anomalies for sea level as described above, we here add the model climatology to the observed sea level anomalies (we choose to compare speed, not speed anomalies). Finally, in order to account for directional differences in the derived results for speed of the geostrophic velocity component, the model results are set to a negative value in cases were the slope sign is opposite in model and observations.